Dyschoriste includes approximately 65 species of annual and perennial herbs and evergreen shrubs , which are widely distributed in the tropics. One or 2 species are occasionally found in cultivation. The species are poorly defined. Dyschoriste species is misrepresented in the trade as dwarf barleria or dwarf philippine violet. 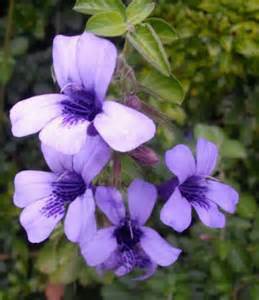 It si only distantly related to Barleria cristata commonly known as philippine villet. The fact that neither species is from the philippine is another story. Synonym: Calophanes hygrophyloides. Brazil. Evergreen subshrub 4-6 ft, zones: 9-11. Blooms spring, summer. Regular moisture. Average, well – drained soil. Full to part sun. Flowers: trumpet purple with darker purple markings in the throat: solitary or in small clusters in the leaf axils. Leaves: ovate to subor-bicular, to 1 in. long, petioles short. Denser spreading shrub. Suitable for informal hedges. Note differing spelling of species and synonym. Orgins obscure (possibly old world tropics). Evergreen shrub, 1-2 ft, zones 10-11. Blooms intermittently winter, spring, summer . Moderate moisture. Average – well drained soil. Full to part sun. Flowers: funnel – shaped, lips elongated, to about 1 in. wide, violet with darker streaks in the throat, solitary. Leaves: ovate to obovate about 1 in.long, sessile, densely clustered on woody, trailing to decumbent branches. An unnamed species with bushy foxtail – like sprawling over rocks and walls. Prune to shape. suitable for hanging baskets and as ground cover.